In the bottom of the screen, you can also Update the plan you have, meaning you can buy additional admins, users, servers or integrations without upgrading your plan. 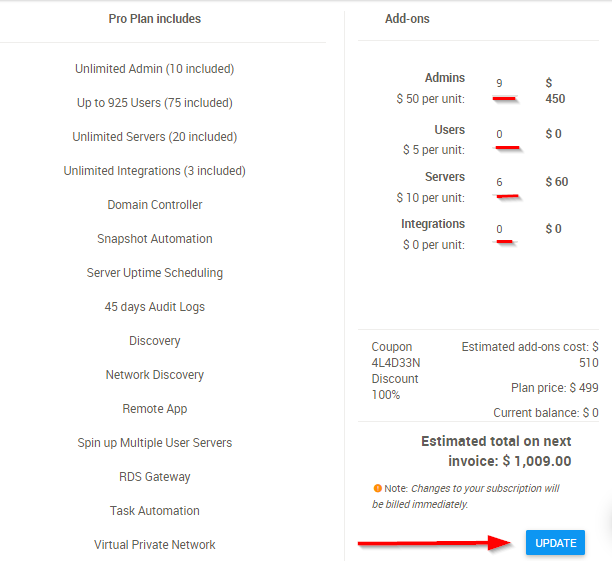 Just edit the number specifying how many additional admins, users, servers or integrations you'd like to add to your plan and hit Update button. You can also remove the add ons the same way as above. Please keep in mind that removing the resources from the portal (users, servers, admins) doesn't remove the add on that was purchased for these resources.